When I was approached about working in a special needs school my first thoughts were, I’m not sure I could do that, I’m not sure I want to work with unresponsive children, in an environment full of medical needs and where children dribble as they eat, in a school at the top of the hill that most local residents don’t even realise is there. Having now worked in Three Ways school for more than 10 years, and been the public face of the school in a huge number of networking events and in the local business community, at awards dinners and events, I can only say that I made the right choice, ignoring and then overcoming my prejudices and preconceptions. I only wish I could show everyone around the school, and give everyone an insight into the creativity, care, innovation and fun that is part of everyday learning here. I’d like to show the world what each child can achieve, and how so many of our young people can leave school and make an amazing contribution to society. I only wish so many mainstream schools and so many adults could learn from our practices, pupils and community. When I started I was given a challenge, one I wasn’t sure could ever be achieved. The headteacher had what seemed like a mad idea. She called me into her office and asked me to look out the window at the bike shed and picnic benches in an unused area at the front of the school. Her idea was to build a cafe where students from the school would work. In the cafe they would not be at school, they would be at work. We could invite the public and employers to come and see what the students were capable of. It would be a business where we would provide training and courses for our students to get them ready for real life. As a mum of three “mainstream” girls, a teacher who had no experience of special needs, and a fundraiser for cancer charities, I had no idea what normally happened to students after they had been through a special needs school. I have since watched young people go camping, work with hugely advanced interactive technology, cook feasts, use public transport alone – then leave the support and guidance of the school and go backwards. Without a supportive family, a great social worker or a forward-thinking college, many of these young people end up being cared for at home and unable to work. I have watched the beginning of this journey as my friend Caroline battles with the paperwork, meetings, hospital appointments, choices of schools and thoughts of the future with her amazingly vivacious, outgoing and capable son who has Down’s syndrome. Alongside all this she is an amazing advocate for learning disabilities, fighting to ensure that her son – and others in the same position – isn’t left at home with an ageing parent and only taken to a group once a week, but is instead given continued opportunities to learn, work and be a fully fledged part of society. One in 50 people in the UK has a learning disability, and just 6% of those known to local authorities and able to work are in employment. How frightening is that if you are a parent with a child with special needs? Surely we can change that? Surely the pressure to support those not in work and their families should spur more projects like our cafe? We know that with the right support, people with a learning disability can achieve long-term paid employment, become more independent and live fulfilling, happy lives. So why are projects like ours so few and far between? 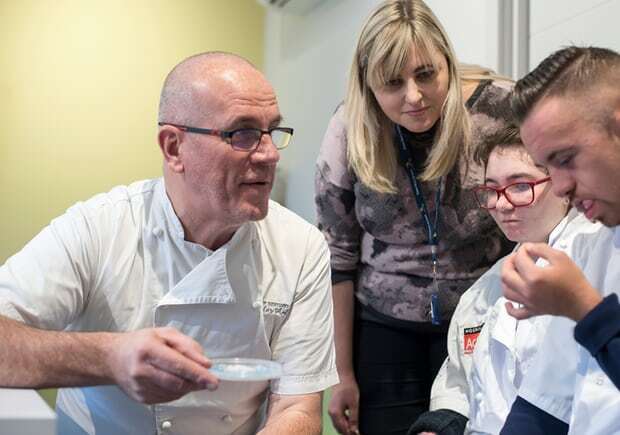 Mencap has carried out extensive research and a national campaign to work with employers to help them to offer jobs to those with additional needs. In my time at Three Ways, I have seen how difficult it is to find work placements for these young people. It’s difficult for companies who are overstretched, understaffed or just simply don’t understand what would be involved in taking on a student. But if employers could see what our students are capable of, see how we support them and how they can be reliable and responsible long-term members of staff, that would surely change. After nine years, and thanks to £550,000 raised from trusts, grants and the community; and builders, architects and volunteers who have donated time, expertise and skills, we have the most amazing, award-winning 3 Cafe Kitchen. The opening was a huge milestone. By the time we cut the ribbon we had been quietly running the cafe for two months and six students had completed their basic food hygiene certificate and were working in the cafe. We saw the expressions on parents’ faces, the hope it gave them for the future. I sat with Caroline, both of us on the verge of tears, talking about how we hoped that people would see what these young people were capable of and work with us to open doors, how exciting it was to know that her son would have this opportunity in the future. I am immensely proud of what we have achieved, it isn’t another packaged “flapjack and soggy sarnie cafe” – we have tasty, freshly prepared food; it isn’t in the corner of a school smelling of school dinners, it is a bright and airy place to visit and a good space for the community. We have been asked to do outside catering for Thrings, a firm of lawyers who have regular networking events. This led directly to our first work placements – in the boutique hotel No 15 Great Pulteney Street – to trial having students in housekeeping, kitchen porterage and the kitchen. It is wonderful to see young people flourish when given the opportunity. I love and cherish the fact that my own children will grow up knowing that they can have a conversation when a child says hello to us in the supermarket. I want them to know that that child, who might be in a wheelchair, or who might speak differently, or who might never read or find it hard to make eye contact, is still a person who deserves to be chatted with, and asked how their day was, and who is just as capable of working and being a part of our everyday lives as anybody else. For as little as $1, you can support the Guardian – and it only takes a minute. Thank you.